Psych, the long-running USA Network TV series, will reportedly be shooting a movie this summer in Vancouver and San Francisco -- and unlike previous similar rumors, this one seems real. A Production Weekly entry says a feature film called Psych is shooting beginning in May, and that kicked internet speculation into high gear. It coincides with a recent convention panel in which recurring antagonist Cary Elwes told an audience in Indiana that he planned to be filming a Psych movie this summer. "We’re all reuniting in July to make some organized chaos," Elwes told the audience, according to The Herald Bulletin. Psych, which ran from 2006 until 2014 on USA, centered on Shawn Spencer, a slacker whose photographic memory and keen sense of deductive reasoning made him a perfect detective -- except for his utter contempt for the local police, born out of a bad relationship with his cop dad (who is also the one who groomed his detective skills; it's all very complicated). He found a way to have his cake and eat it to (along with lots of pineapples over 8 seasons) by convincing local law enforcement that he was a psychic and contracting out his services as a consultant. 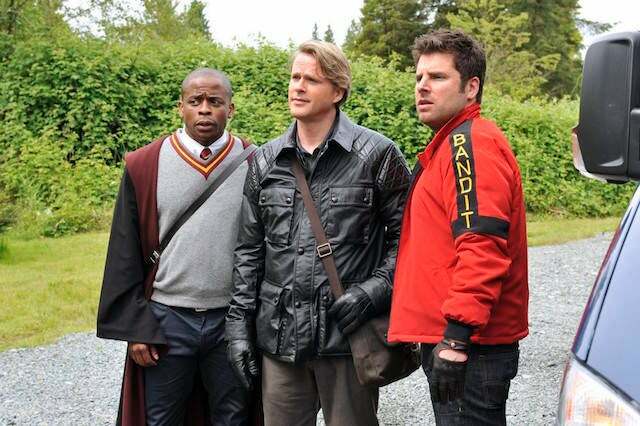 James Roday starred as Spencer, alongside Dule Hill as his long-suffering best friend and crimefighting partner Burton Guster. Other cast members included Maggie Lawson, Corbin Bernsen, and Galavant's Tim Omundson. Elwes played Pierre Despereaux, originally introduced as a master thief but later revealed as alternately a con man who faked all of his heists, or possibly an Interpol agent who had been in deep cover investigating white collar crime for years. It was a question as to Desperaux's exact nature that extracted the quote about the movie from the actor. "It’s a good question, and I believe it all will be revealed in the film that we’re making this summer," he told the audience member who asked about Despereaux. In Psych's finale, stick-in-the-mud Carlton Lassiter (Omundson) was left to be the chief of the Santa Barbara Police Department, while Shawn and Gus followed Shawn's gilfriend Juliet (Lawson) to San Francisco. While a feature film might seem like an odd direction for the property to go, the more likely scenario is that they're filming one or more Columbo-style TV movies -- a format that's come up before when discussing possible futures for the show's characters. Don't be surprised if more information comes to light on this over the weekend, as Dule Hill is set to star in Sleight, a well-reviewed, low-budget superhero movie, which debuts in theaters tomorrow. More details on this as it develops.